Libya – Is This Political? This is not a political blog. Plenty of those around for your reading pleasure. But when stuff like this happens it just shows how our government and leaders can say anything and expect us to believe it. Let me just get you updated quickly on this story. 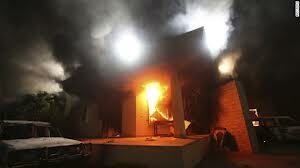 On Sept. 11, 2012, heavily armed Islamist militants stormed and burned the American Consulate in the eastern city of Benghazi, killing the United States ambassador to Libya, J. Christopher Stevens, and three others: Sean Smith, a Foreign Service officer, and Tyrone S. Woods and Glen A. Doherty, both former members of the Navy SEALs who helped protect diplomatic personnel. American officials initially described the violence as part of riots that had broken out in Benghazi and Cairo that day in response to an American-made video promoting an anti-Muslim film called “Innocence of Muslims” that had been uploaded to YouTube. The amateurish 14-minute trailer mocked Islam’s founding prophet. But later accounts provided by the State Department made no mention of a protest. Instead, they pointed to the extremist militia Ansar al-Shariah, as well as Al Qaeda’s arm in North Africa, Al Qaeda in the Islamic Maghreb. A few days later, President Obama called the incident a terrorist attack. The U.S. intelligence community has revised its assessment of the deadly attack on the American consulate in Libya, saying it now believes it was a deliberate terrorist assault. In an unusual statement, the Office of the Director of National Intelligence sought to explain how it has revised its view of the September 11 attack on the diplomatic post that killed Ambassador Christopher Stevens and three others. The assessment moves away from the initial belief the Benghazi attack began spontaneously following a protest over an anti-Muslim film. The intelligence community now believes it was “a deliberate and organized terrorist assault carried out by extremists” affiliated or sympathetic with al Qaeda. On “Face the Nation” yesterday, Senator Lindsey Graham, R-S.C., accused the Obama administration of either “misleading” Americans about the nature of the attack, or of being “incredibly incompetent.”Graham said that evidence is “overwhelming” that there was no riot. He said he was briefed by members of the intelligence community who are on the ground in Libya and was told that it was a “sustained attack that lasted for six or eight hours, using heaving weapons.”Graham said he believes the administration knew “within 24 hours” that the attacks in Benghazi that killed four Americans, including Ambassador Chris Stevens, were coordinated and were conducted by an al Qaeda-associated group. More political jive? A cover-up by the government? Focused more on getting re-elected or on protecting our nation? Americans are dead. We continue to believe that we can control/influence this region of the world. Unfortunately our efforts have had no impact and this entire region is on the brink of disaster. What are we doing? Please let me know what you think by posting your comments below. Next postYou’ve Got Mail – ALTO? I personally think the answer is simple, repeating history! We just haven’t learned our lessons yet and very likely never will. All across Africa and the Middle East, long before the Americas were the target of invasion; European countries picked on those parts of the world for a slew of reasons, resources, slavery, whatever. Go back as far as you want in history, Egyptians, Chinese, Romans, Vikings, Cave Men, it’s our nature to destroy everything in our paths, even it’s our own kind. Unfortunately the US has fell into that same old tradition, only now we make up new reasons, national security, US interests(oil), WMD, etc. Not surprising giving our own history as a nation. Native Americans have a very different world view, and would essentially tell you, “what goes around, comes around”. And it does, where’s the Roman Empire, Chinese Empire(s), British Colonies…. Unfortunately, most often we tend not to think through logically and deeply and offer superficial opinions. Those who are against wars overseas are also generally against an “above all” domestic energy policy. If we have rapid and complete energy independence, we can let the middle-east and northan Africa to turn back to what they were – seas of sand! But rapid and complete energy independence might mean Nuclear and Coal, which most pacifists oppose as well. If you are against everything, then you are for nothing; you have no choice except to take what you are given. All theycan do is to complain……………………..which may perhaps be all that they truly want to do! I’m completely confused by your comments. Are you saying we can’t have energy independence without war? You mention coal, which goes back a long time, before oil, so you can say “we” have already had energy independence. And guess what, there were plenty of wars. So to use energy independence to justify war just doesn’t resonate for me. For me, it’s always has been and always will be about greed, power(politics, religion, energy, land, money, drugs, etc.). Go back in history as far as you care to for any given region of the world and I’d wager you a coffee that the reasons for “war” comes down to greed. I’d also wager that even if we do get to 100% foreign oil independence, the US will still be involved in the northern Africa and Middle East conflicts. We have been before oil became our crutch! American companies have far to much $$ invested in oil and those regions, so even if the US gets to 100% independence, they will still have plenty of other “clients” for their products. Curious that you think of that region of the world as just seas of sand. I’m sure the people that call that area “home” wouldn’t see it the same way. They’d also probably like nothing more than to be rid of the oil rigs and all the other non-native machinery and whatnot that now pollutes their “homeland”. Your view is unfortunately a typical American point of view, and a trait that people in general can’t seem to shake! I’m sure there’s at least one Native American out there wishing that the Americas could turn back to seas of untarnished land. Talk about being free of foreign influence and energy dependence, look no further than just a few hundred years ago and the ground you are standing on!